I’m doing bachelor’s degree in “Geology and exploration of mineral resources” at KBTU, Kazakhstan Almaty. 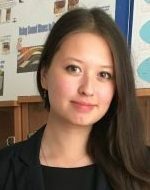 I’ve been involved in scientific activity for several years now, starting from the project “Advances in coalbed methane reservoirs integrated characterization and hydraulic fracturing for improved gas recovery in Karaganda coal basin, Kazakhstan” that was presented in Annual Caspian PetroCongress, Satpayev University, Almaty, 2017, where we took 2nd place; later that year we participated in poster contest in European Geoscientists Union (EGU) conference 2017, Vienna, Austria. Our project with some additions was presented in Oil & Gas Horizons IХ 2017, Moscow, where it won the first place. We`ve also participated and won first places in several regional intellectual games relating the Geology and Oil and Gas industry during "Astana Munay Fest" conference in Nazarbayev University, Astana, 2017; Annual Caspian PetroCongress, Satpayev University, Almaty, 2017.